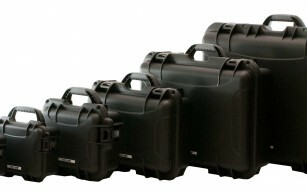 Airtight, waterproof ATA certified case with individual slots, superior cushioning and no exposed debris generating agents. Holds 10 LTO / 3592/T10K/3590/3490/9840 tapes with or without their plastic jewel boxes. Stainless steel hardware. Double movement latch prevents accidental opening for added protection. Double pad lockable. Superior cushioning and no exposed debris generating agents. Holds 10 Tapes – LTO, 3592, T10K, 3590, 3490 or 9840 tapes with or without their plastic jewel boxes. Double movement latch prevents accidental opening for added protection.